Tom was born January 16, 1925, to Cornelius E. and Jessie (Mickle) Ross in Newton, IA. He graduated from Dowling High School in Des Moines, IA. Tom was united in marriage to Mary M. Kersey on October 30, 1948, in Des Moines. He served in the U.S. Navy during WWII. Tom farmed the rural Marshall county area for 40 years. He was a licensed realtor for Ed Mead Real Estate from 1993 to 2009. Tom was a member of St. Mary Catholic Church, 4th Degree member of the Knights of Columbus, St. Mary’s Endowment Committee, Catholic Men’s Club, charter member of the Iowa Cattleman’s Association, President of the Marshall County Cattleman’s Association, member of the Marshall County Pork Producers, 4-H Leader for many years, served on the Board of Directors for the Beaman Coop, American Legion, and Green Mountain Lion’s Club. 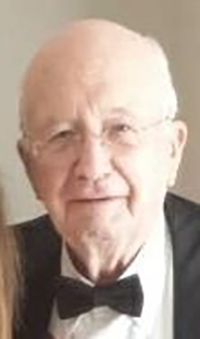 Tom will be missed by six children: Linda Ross of Des Moines, Ed (Betsy) Ross of Kirksville, MO, Tim (Annette) Ross of Peachtree City, GA, Mark (Kathy) Ross of Marshalltown, Becky Ross of Marshalltown, Julie (Jerry) Logan of Marshalltown; eight grandchildren: Toby, Tawny, Marty, Ryan, J.J., and Sara Ross, John and Macy Logan; eight great grandchildren: Mason, Ethan, Christopher, Olivia, Julian, Julia, Theo, Easton; and a brother, Pat (Elsie) Ross of Bondurant, IA. He was preceded in death by his wife, Mary, a grandson, Bobby Ross, in infancy, two sisters; Lorraine Ross, Mary O’Mara, and a brother, Bill Ross.